A delicious chocolate fountain is the perfect addition to any kid’s birthday party. 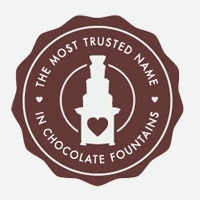 Not only do most kids love chocolate, but chocolate fountains are fun, interactive, and just messy enough. Which kid doesn’t enjoy deviating from eating dessert with a knife and fork? Here are some tips for making a chocolate fountain kid friendly. It’s important to remember that kids are less refined and composed than adults standing in line for a trip to the chocolate fountain. A good way to protect the chocolate is to use a wind/sneeze guard, especially if the party will take place outdoors, to keep the chocolate for chocolate fountains from getting contaminated by a sneezing child or debris on the wind. It’s also a good idea to ask parents if a child has any food allergies, since common food allergies among kids includes nuts and strawberries, which are also common dipping treats. To be on the safe side, you might steer clear of these items just in case, especially since there are so many other options for delicious dipping treats. It’s important to remember that kids will be kids, and that means that when they are encouraged to dip treats into melted chocolate, a mess will likely occur. If the party is outside, you don’t have to worry as much about dropped chocolate covered dipping treats staining carpet, but an inside party might encourage a specific area designated for chocolate fountain dipping and eating. If the room has carpet, lay out a vinyl “picnic” blanket that mimics the party theme and have the kids gather on this to eat. If kids are faced with a platter of fruit and a platter of cookies and confections, they will likely choose the sweeter options for dipping in chocolate. Keeping the choices simple is important because too many choices could be more chaotic in the end. Consider skewers of banana slices, a fruit every child will recognize and that tastes delicious dipped in milk chocolate for chocolate fountains. For sweets, consider angel food squares, which don’t crumble easily, small sugar cookies and colorful marshmallows. These foods are all delicious slathered in chocolate for chocolate fountains, and they are easily recognizable to picky kids. They are easy to skewer, so that you will have less occurrences of floating food in the chocolate fountain. Following these tips will ensure your next birthday party event will not only be kid-friendly, but will have every kid at the party wanting a fun and yummy chocolate fountain at their next birthday party.